Like many in these United States–and around the world–I am tuned into the second inauguration of Barack Obama: a time of assessment, a time of re-set of goals and hopes. The last time around I was on the Mall, one of the 1.8 million who wouldn’t have missed that historic moment for anything in the world. Much has changed because of this man’s leadership. There is so much more to do. The question for those of us tuned in this time from the comfort of our homes: how can we help? Here’s a piece I wrote from Washington, DC for The Women’s Media Center, my thoughts on the first swearing in of the first African American president. In the darkness of predawn, we walked silently through the streets of Washington to take our places on the mall. As the day began, there was no noisy jubilation, only the sound of forward movement, a determination to secure a spot to witness history. Mine was about midpoint among, we believe now, a million and a half witnesses. I stood next to a middle-aged man wiping tears from his face as his wife leaned into him; behind a mixed group of young men—black, Asian, white—in awe of the spectacle; in front of a group of older black women, quietly insisting the younger, taller ones stoop down so they could see. They responded quickly with a smile. I’ve never been in a more congenial, optimistic, unified throng. I’m sure the others were like me: carrying our ancestors on our shoulders for a good look at what was about to happen. I carried my late mother, born on a farm in deeply segregated Lowndes County, Alabama, one of 15 children with a not atypical heritage: parts slave and slaveowner, even a few confederate officers tossed in. My late father was there, too. Born in a time when black men were denied first-rate educations, he and my mother nevertheless carved out a successful life in the old America, needing to fight every inch of the way against discrimination and unfairness. Because of that fight, their granddaughter graduated from Yale and Harvard. I had that daughter with me, too, courtesy of texting—from the mall to New York City and back, our expressions of incredulity and celebration. A president that reflected our life experiences was now being sworn in: the crowds cheered and waved flags—American flags that belong once again to everyone. My daughter’s late father was with us: an immigrant from Jamaica who came to America as a dishwasher and created two signature New York City restaurants of his own. My son was on my mind: adopted as a baby, his heritage is Latino, his biological parents from Puerto Rico and the Dominican Republic. But most essentially he is a black man in America. Suddenly, possibilities for him seem improved. And I thought about my granddaughter—due in April, a biracial child who will come into the world with a biracial man as President of the United States. The world for her will never seem alien. She arrives at a moment in history when she is actually a part of the narrative, not the subtext. 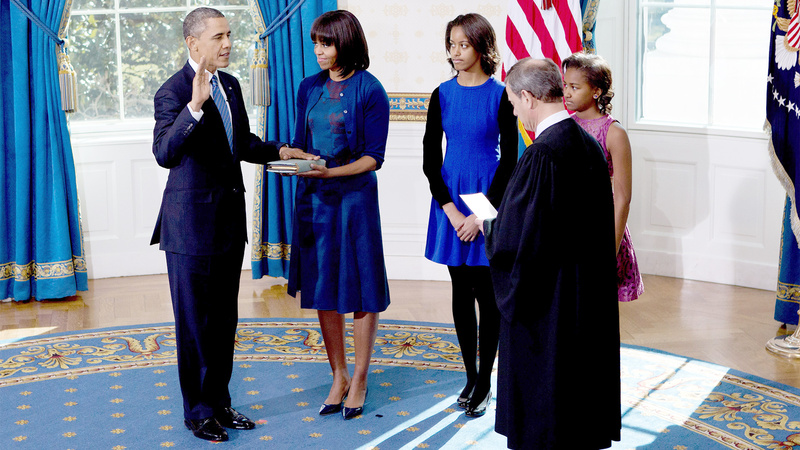 Barack Obama, in one sense, remade America by taking the oath. But the most important messages of this historic inaugural were not words—they were acts. On Monday here in Washington, D.C., we celebrated the birthday of Martin Luther King, Jr. Then still President-elect Obama took a paintbrush to the walls of a shelter for homeless teens—part of the declaration of a day of service in memory of the slain civil rights leader. Thousands more across the city did the same. This is our true mission as we leave the scene of great celebration: to remember the homeless we saw sleeping in doorways as we made our way to the fancy inaugural balls last night. To determine acts to accompany the words that will counter the deepening economic distress we woke up to this morning—affecting, increasingly, not only the anonymous buried in the statistics, but people we know, perhaps even ourselves. To remember the women, still the poor and vulnerable of the world. And to remember that ever more importantly, we must tell their stories—tell them straight and strong so we move people to act, as well as think and feel.